My friends Mike Kerr and Renata Liwska have created the "Alberta Illustration Awards" and will be hosting an exhibition in their gallery, RandM Collective. It opens this Thursday, September 26 from 5-8pm on the lower level of Art Central. They are organizing a series of illustration events over the next month and UPPERCASE will be involved in a few as well. Stay tuned for details. "Alberta is well known for its western heritage, natural beauty, and the energy industry. But what about art? Albertans would be surprised by the success and influence its illustrators and designers have in Canada and beyond. 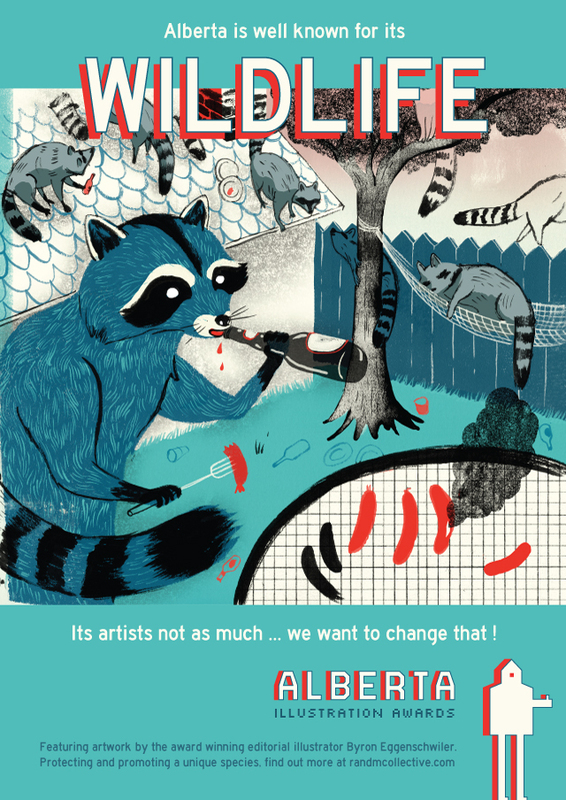 This fall we will be showcasing current and former Alberta illustrators and their work through a series of exhibits, discussions, and workshops. It begins with an exhibition of work titled Elevating Alberta opening Thursday September 26, 2013 from 5-8pm at our studio RandM Collective. Over 40 artists will be involved and include illustrators from a wide range of genres including magazines, books, comicbooks, videogames, fashion, design, and advertising: Lincoln Agnew, Joy Ang, Tom Bagley, Raymond Biesinger, Laura Bifano, Jason Blower, Tivadar Bote, Scott Carmichael, Byron Eggenschwiler, Carolyn Fisher, Brian Ford, Doug Fraser, Mark Gerviais, Shane Hawco, Jacqueline Hudon-Verrelli, Brennan Kelly, Jenn Kitagawa, Karen Klassen, Scott Kowalchuk, Jacqui Lee, Renata Liwska, Matt Luckhurst, Geoff McFetridge, Michael Mateyko + Hans Theissen, Kyle Metcalf, Sandra Mills, Sandy Nichols, Claire Ouchi, Guy Parsons, Thomas Porostocky, Pablo Puentes, Rick Sealock, Genevieve Simms, Kim Smith, Fiona Staples, Kelly Sutherland, Jillian Tamaki, Lauren Tamaki, Danae Thompson, Janine Vangool, Sam Weber, Dave Whamond and Brad Yeo." I am happy to say that I have worked with each of the illustrators whose work is shown above, either showing their work in my former gallery, featuring them in the pages of UPPERCASE magazine or a past edition of Work/Life or commissioning original illustrations for the magazine. When you're here for our Paper Stampede on Saturday, be sure to stop by our neighbour SEITIES. This fine art photography publication and gallery is holding an exhibition of rodeo and prairie life photography. We were supposed to have our big studio sale last month, but that was postponed due to the flood. For our last hurrah in Art Central, we decided to do something more that just a studio sale: we've invited our friend Janice of Papier Valise to share her amazing selection vintage papers and notions as well. Paper Stampede is this Saturday July 13 from 11-4 at our location in Art Central (#204 - 100 7th Ave SW). It's an event for paper lovers featuring lots of bundles of great paper ephemera, stationery items and various creative fodder that we have collected over the years. Some furniture, cabinetry and fixtures will also be on offer. 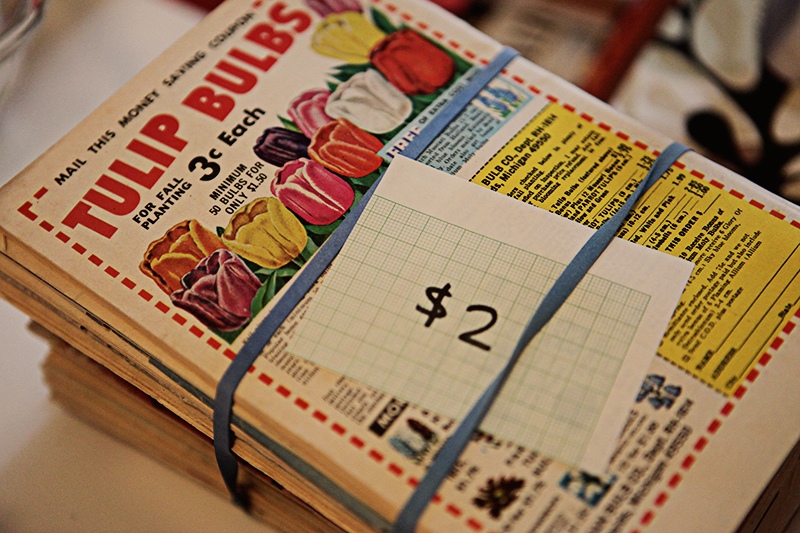 Papier Valise, purveyor of vintage treasures will have office supplies, vintage labels, buttons, vintage jewellery-making findings, wall paper and millinery accessories. UPPERCASE's latest issue has just been released and highlights collage and assemblage—pick up our latest issue along with free paper scraps and old maps for added inspiration. Our Art Central neighbours will also be participating in the event with prints, illustration and photography displays. Below are some photos of my preparations of paper bundles to whet your appetite. These are some furniture-themed printing blocks I've been saving for no particular reason. They make beautiful display pieces, so I'm putting them for sale on Saturday. Lots and lots of old maps, great for decoupage and collage. I used to use them in making my Near & Far Eclectonotes. I'm also paring down my reference and inspiration books. Lots of great stuff either inexpensive or free! hey YYC, Saturday is a great day for paper lovers! Our friend Janice of Papier Valise (featured in issue 12) will be at this Saturday's Collectibles Market at the Hillhurst-Sunnyside Community Centre in Calgary from 10am-4pm. My recommendation? Go see Janice first and then head on down to UPPERCASE (our sale is 11-4). That way, you can show me what you bought from Janice and then score some more (and mostly FREE) paper ephemera from my studio clearout. Janice will have some vintage office furniture such as a fabulous child-size industrial desk, several desk trays, postcard racks and rolling industrial files. She also has a selection of letters and numbers made of paper, metal, plastic and porcelain. There's lots more on offer, so check out the Collectibles Market. I will have a selection of old maps, magazines, catalogues and miscellaneous paper ephemera on hand. Most of it will be free (excellent for collage art) and some of the more unique items will be modestly priced. See more of it on Instagram. One of my special items for sale is my beloved made-in-Japan Print Gocco that comes with an array of inks, lots of bulbs and accessories. If you've ever wanted to print greeting cards or on fabric but don't want do full-on silkscreening, this is a fun tool to try. I used to print greeting cards for the shop back in the day. If you follow me on Instagram, you might have seen these shots on Friday. I finally signed the lease document for the new home of UPPERCASE. It is a relief to have those legalities done and now I can start sharing updates and images. The space is currently a real diamond in the rough. My new landlord sees the potential as well and I am really happy that I've been able to select finishes so that it will suit our aesthetics. It's going to be beautiful. The obligatory BEFORE shot. The space is being used as a catchall for other renovations. Get your hands on out-of-print back issues! Do you love UPPERCASE magazine but you're missing a back issue? Have you recently been introduced to this quarterly magazine for the creative and curious and now you wish you had them all? The purpose of this auction is to raise funds for the upcoming studio move (our current home of the past 8 years is in a building slated for "redevelopment" and so we'll be moving to new accommodations later this summer). Due to the heavy weight of the package, this stack is only available to ship within North America. However, we have created other listings for individual out-of-print back issues #1, #2, #3, #4, #5, #6, #7 and #12 that we can ship internationally. Click here to see the listings on eBay. Bidding ends next Friday, May 31. Vancouver-based photographer Tracey Ayton was recently in Calgary on some shoots and she stopped by to visit the UPPERCASE studio. Here are some images of my workspace that she captured; there are more on Tracey's blog. We have published Tracey's work in the current issue (#17) where you can see a photo essay about Granville Eyeland Framemakers. I was happy that Tracey was here to capture some images of the space "au naturel" (no tidying! ), though I am also planning on a final photographic study of the studio to feature in the fall issue of UPPERCASE. By the time the fall issue is out, this space will be a memory and UPPERCASE will be nestled into our new office. It is hard to believe that I'll have to move it all in a few short months. Today, Calgary's Metro News published an article entitled, "Calgary's Art Central Facing Closure." As my Calgary friends know, Art Central has been UPPERCASE's home since the beginning. Suite #204 was just an empty shell without shelving or lights when I first saw the space in late 2004. By early 2005, I was a happy tenant in a building concept with a lot of potential. With gloriously large windows, an old brick wall and a white slate of a gallery office, the space was endlessly inspiring and motivating. Initially, freelance graphic design was my main occupation and UPPERCASE-related projects were side projects and creative experiments. "UPPERCASE gallery, books & papergoods" sold greeting cards of my own designs, handmade notebooks, hosted illustration shows, had a small selection of books on design and a nice supply of pretty paper goods for a growing number of walk-in customers. In tandem with the physical store, I began to sell my offerings online and to dedicate time to growing an online community through the UPPERCASE blog. In 2007, UPPERCASE hosted an unusual gallery exhibition and launched its first book. The Shatner Show was an illustrated homage to William Shatner (of Captain Kirk fame) featuring 76 illustrations of his life and career. Endorsed by the man itself, the show was a great success and was featured on international newscasts and garnered a lot of positive press. But more importantly, it showed me my true calling: publishing. Fortunately, the magazine was well-received but I quickly discovered that it was far more work than I could ever have guessed. At the end of 2009, I closed the retail aspect of UPPERCASE. Growing a retail business in Art Central seemed to be an uphill battle—especially when compared to the success of online sales. When comparing the results from a bit of foot traffic with the potential of online traffic, the decision to close physical retail was obvious. (I also had the costs of inventory as well as print bills to consider.) Expecting a baby as well, I knew that though I can juggle a lot at once, new motherhood plus publishing plus retail was just too big of an equation. I have no regrets about closing my retail store, though I do miss all those lovely stationery goodies and the joy people expressed when stopping by for a visit. I was also aware that closing my shop, a regular destination for many Calgarians, could impact my neighbours in Art Central. I remained committed to Art Central and our doors were open to curious walkers-by and we were active in First Thursdays and hosted occasional shows in our gallery. For locals who still visit Art Central, it has been hard to miss the steady increase in vacancies over the past number of years. In this post I'm not going to go into detail about why the Art Central concept has been so difficult to sustain. But I do think it would be useful to write a post-mortem about what happened (or didn't happen) here, particularly in comparison to the seemingly successful creative entrepreneurial centres such as Wychwood Barns, Konstepidemin and the American Can Factory profiled in issue #16 of UPPERCASE. Over a year ago, the Art Central building was sold to a new owner; a property company that purchased this building along with many others in the downtown core. I stress that they purchased the building—they did not take on a stewardship of the Art Central concept, a concept that had been seriously malnourished for many years prior. Now the news is public that the building is going to be "redeveloped" ie demolished to "replace the current building with a taller structure that may incorporate commercial and residential spaces," tenants are left to determine what they're to do next. The story about the impending closure of Art Central might be breaking to Metro News today, but tenants here have known about this since late January when were told in a meeting that the building was slated for redevelopment. Though I suspected that something significant might happen eventually (rumours were certainly afoot) I wasn't prepared for the immediacy conveyed in a statement by the VP recommending "look for your alternatives now while you can." In response to the media queries that I have received about Art Central's impending closure, I would like to state that the story here isn't about big vs little, corporate vs arts. The concept had failed long before these new developments. My work and my life have been intricately woven with Art Central for eight years. Now, facing its closure has been somewhat like having a loved one with a terminal illness. After the initial relief that it will soon have a resolution to its misery comes time to grieve for what is lost and what might have been. I've been quite depressed about the news; it has been hard not to picture my beautiful studio in a pile of rubble. At first there were days when I stood at my doorstep at home, unable to motivate myself for the walk to work. On one hand I didn't want to be reminded that Art Central could be demolished; on the other hand I didn't want to waste any time away... So I did what I usually do when faced with a problem: I set out to solve it. I am happy to say that I have found a contender that is somewhat different from my current studio, but it inspired me the moment I walked in. Now, rather than imagining endings, I am looking forward to new beginnings and the potential of this new location. I look forward to chronicling that adventure when the time comes. It has been difficult not to share this news with you until now—my wonderful community of supporters here on the blog and Twitter. I know I have your support as UPPERCASE moves forward and continues to flourish. Please also support the other tenants at Art Central. For those with galleries and retail, it has been difficult. They remain open for your business! 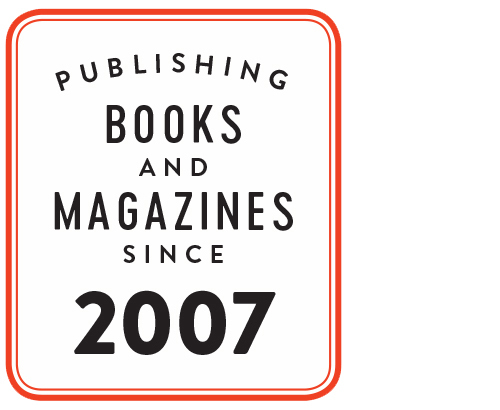 Publishing books and a quarterly magazine has been far more challenging and exhilarating and fulfilling than I could have dreamed. I am very lucky to be doing what I do. As I left for home yesterday, I paused to take this panoramic iPhone picture of UPPERCASE headquarters (mess and all!) Click to view it larger. The creative and curious of all ages are invited to join us for our Holiday Party. If you're able, please bring your favourite holiday treat to share. We will also be open from 1-4pm for any shopping you'd like to do. When I saw Rob preparing Axis' new show of Lisa Brawn's work I was completely smitten with "Lucky". Dimensional wood script letters in red and pink shiny lacquer? yes, please. See more of the show on Lisa' flickr set. No such thing as a mistake! In contrast to the POP, there are also many gorgeous woodcuts from her bird series to choose from.